Since the aluminum version of the Ford F-150 appeared with the 2015 model year, consumers, OEMs and collision repairers have wondered if it’d be more expensive to fix than the steel version. We might have an answer. State Farm, the nation’s No. 1 auto insurer, concluded next-generation 2015 F-150 (and the 2016) premiums could be about the same as the steel finale 2014 F-150, according to Ford. It’s official: @StateFarm make and model ratings for the 2015 and 2016 Ford F-150 remain similar to those for the 2014 Ford F-150. Levine didn’t have many details, other than reiterating what he’d tweeted. “You’d have to talk to them” for more about what State Farm found, Levine said. He directed us to State Farm corporate public affairs staffer Vicki Harper, who emailed us she’d track down someone who could share more about our inquiry. 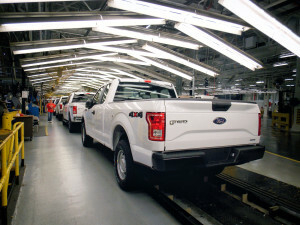 Ford had consistently held that a properly trained and equipped shop should be able to repair an aluminum F-150 panel at the same time and cost as a steel one, thanks partly to the truck’s modular, remove-and-replace procedures. But the past year has seen competing information and views on how expensive or status quo aluminum F-150 repairs would truly be. After all, shops which hadn’t developed the equipment, work area and staff training to work on equipment needed to spend tens of thousands to get it. A key way to recoup that would be to introduce higher rates for aluminum labor than steel labor. Piece-rate techs might have to slow their pace on aluminum repairs to ensure they’re completing unfamiliar tasks correctly, demanding a higher rate to compensate them and the shop for lost productivity. Paintless dent repair is also almost certainly more difficult with aluminum with steel, commanding higher rates as well. In August, an informal poll completed by a couple hundred Mitchell webinar listeners revealed an overwhelming prediction that the aluminum truck would have higher repair costs. The audience was slightly more split on whether insurance rates would climb for the new F-150, with 65 percent of the respondents — webinar presenter Greg Horn estimated 77 percent of the approximately 500 attendees voted — saying yes. Four percent said no, which seemed to imply rates would in fact lower, as 31 percent voted that rates would stay the same. An IIHS spokesman said Wednesday he’d check and see if the IIHS had any new thoughts on the truck and its insurability since then.